Traded to Jets by Pittsburgh Penguins for Winnipeg's 1st round choice (Doug Bodger) in 1984 Entry Draft and future considerations (Moe Mantha), March 5, 1984. 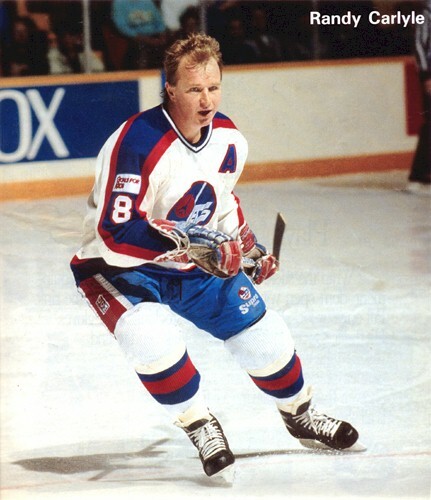 The Jets acquired veteran defenseman Randy Carlyle from the Pittsburgh Penguins late in the 1983-1984 season and he spent the next nine seasons with the Jets. 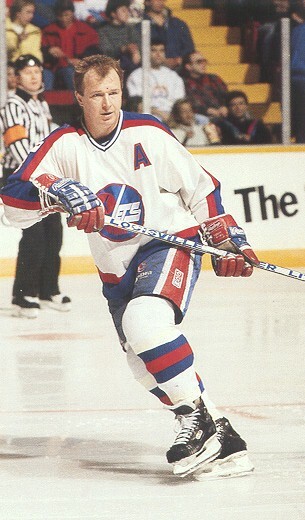 The former Norris Trophy winner became a leader on the blue line and off the ice and he remained with the Jets as an assistant coach after his distinguished playing career came to a conclusion. His most embarrassing moment as a Jet came against the Los Angeles Kings when Bernie Nicholls yelled “Hey, Kitty” and Carlyle fed him a perfect drop pass. Nicholls then went in alone and beat Daniel Bouchard to tie the score. To add injury to insult, in an attempt to catch Nicholls, Carlyle also fell and reinjured his thigh.